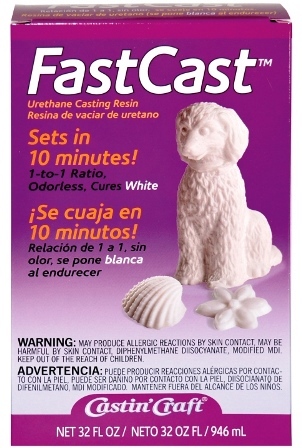 Pristine White Casting Plaster – Case/12 3-lb. Boxes/36 lbs. 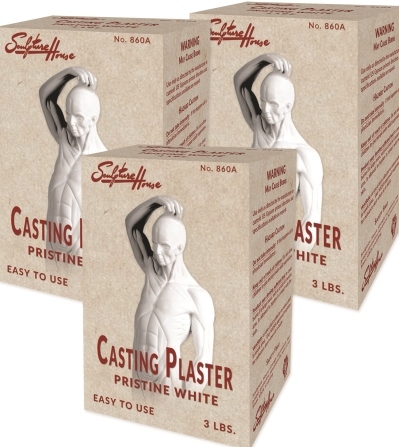 To be more ergonomically responsible by reducing our case weights in accordance with safety guidelines, Sculpture House is proud to introduce our re-packaged Pristine White Casting Plaster in 3-lb. units with available cases of 12 3-lb. units/36 lbs. Our Casting Plaster, a gypsum product, is a pure white, smooth, slow setting plaster for casts, molds, and direct modeling. This casting material can be used for building mother molds and has enough strength to create a positive cast. A must-have when choosing to reproduce a piece of sculpture for posterity. For additional information, please contact Sculpture House. Introducing Grafix’s new Demonstration Kits! 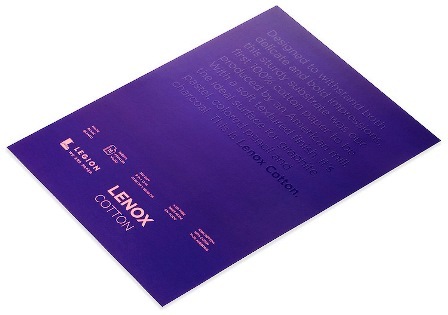 Designed to educate and inspire consumers on a variety of Grafix materials. 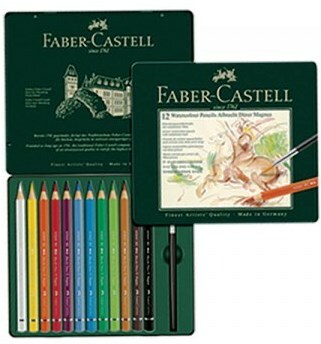 Each kit includes a specific technique guide with illustrations that are simple and easy to follow, along with art supplies and additional information on every product. Contact Grafix at [email protected] for more information on how to get your own Grafix Demonstration Kit! Stop by booth #1031 at Art Materials World 2017 to see them and even try them yourself! We are excited to introduce an innovative new line of fine art papers for artists of all ages and skill levels. We listened to the vast requests we heard from artists and have incorporated a unique new feature into these pads. This feature coupled with other important attributes have never been combined into one pad line before. A revolutionary easy, 3 step way to create unique canvas stretchers by the consumer! SMART BLOCKS ™ utility and design US Patented "US 8418383 B2 " Canvas Frame Kit for the first time, permits the end user to create canvas frames of unorthodox and irregular configuration to be matched with a supplemental frame to present a single, unified work of art separable at the whim of the user. From the makers of Chromacryl, the leading choice for scholastic acrylics, comes the new Chroma 2 Intense & Opaque Heavy Bodied Washable Tempera! 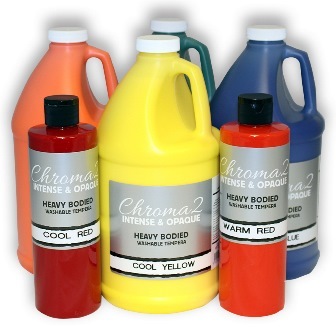 With the quality you’ve come to expect from Chroma, we introduce Chroma 2 Intense & Opaque Heavy Bodied Washable Tempera. Teachers usually expect washable paints to be weak and lack intensity. Our new Chroma 2 Heavy Bodied formula overcomes this problem, providing strong colors and thick creamy body. The non-toxic, vivid colors and opaque coverage are unmatched among washable temperas, making it the perfect choice for all your painting, printing and classroom needs on surfaces such as paper, canvas, cardboard, plaster, clay and more. 14 colors available in 16 oz. and half gallons. You’re already familiar with the great value and performance of Stonehenge papers for printmaking and drawing. Now we’re excited to introduce Stonehenge Aqua - the newest member of the Stonehenge family for watercolor artists. Stonehenge Aqua is as finely crafted as it is affordable. Performing way beyond its price point, it has been tested to its limits and as it turns out, it has no limits. Wet-on-wet or wet-on-dry, it has a wonderful crispness that anchors beautiful work across every task and technique. With Stonehenge Aqua, blending is effortless, lifting is no longer a chore. It welcomes masking while never relinquishing the control you both demand and desire. Bright colors dry bright. Blocks or sheets, it is flat paper that dries flat. Coldpress or Hotpress, Stonehenge Aqua is everything an expensive paper is without the expense. For more information please visit www.legionpaper.com/stonehenge-aqua. Art is about connections. Between structure and the whole, ideas and the viewer, the medium and the maker. No matter what the piece of art, all of its elements must work together. Everything must be connected. At Legion, our art is paper. And now we are proud to announce our new redesign, a bold disruptive look that takes three of our papers, new and old, and connects them so you know that you are getting the quality, consistency and substance you demand for your art. It was time to break tradition. To create something the market had never touched upon. The design-savvy covers strip away the clutter of conventional pad covers, using a varnish text against a solid background color to capture the attention of the artist without being intrusive. Designed for the artist’s eye, the clean, bold type tells you the paper, a beautiful gloss overlay paints an ephemeral verbal picture of exactly what that paper can do. Orange on purple? That’s Stonehenge Light. Red on orange? That’s Yupo Medium. And so on and so forth. The papers haven’t changed, we’ve just made it easier for you to find them on the shelf and given them a look you'd be proud to leave out in your studio or on your coffee table. Together, all these covers will connect all of our brands under an umbrella that any novice can recognize and any artist can appreciate. And connections are what it’s all about. We are Legion. We are paper. For more information please visit www.legionpaper.com. From the moment it was founded, Canson has been creating papers that meet the most exacting quality standards, combining the savoir-faire of hand craftsmanship with innovative technologies. The proof can be seen in L’Aquarelle Canson Héritage, born of our intimate history with the artists of yesterday and tomorrow. 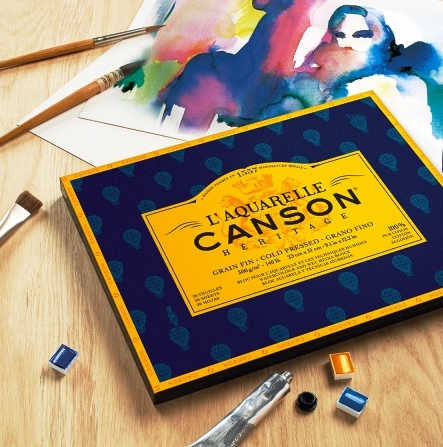 L’Aquarelle Canson Héritage is a premium 100% cotton watercolor paper. Mold made with non-gelatin sizing. Artists will love the ideal absorbency, exceptional rendering, perfect washes, superior strength, and color intensity that this paper offers. 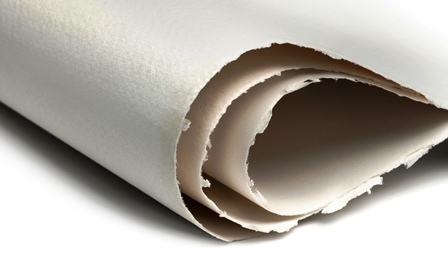 This unique paper is sensual to the touch, worthy of the finest “handmade” papers. Its innovative design also ensures uniform washes, vibrant, true-to-life colors, and incredibly crisp rendering, all while ensuring whiteness (wet or dry). Since 1987, Bob Ross has created 1.16 million first-time painters in the U.S. alone. Dixon Ticonderoga Company is extremely pleased to be able to re-position the world-renowned brand of Bob Ross. Now having ownership over the licensing as of January 1 2017, the Bob Ross brand will be better positioned in the marketplace and to end consumers. Through the repositioning of this happy, vintage, recognizable, friendly, and reputable brand, Bob Ross will continue to be welcomed into the homes of everyone worldwide. We are looking to enhance the Bob Ross brand by developing new, eye-catching product packaging, enhancing product quality, and aligning both key customer goals with our own, through comprehensive and detailed marketing/promotional initiatives, which will include in-store lessons and tutorials, social media content, and workshops. The diversity of the Bob Ross technique and ease of implementation empowers the artist in us all. Based on the concept of “No mistakes, just happy accidents!”, both entry level artists looking to develop their artistic skills, and adults and seniors looking to discover a new hobby will be able to express themselves through fine art. 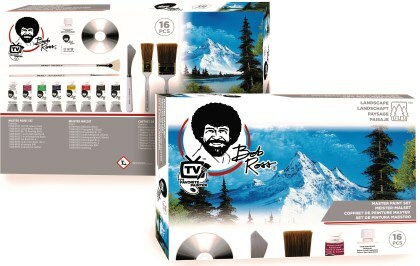 We are proud to present the newly re-designed Master Paint 16-Piece Set, which was carefully put together by Bob Ross himself; he handpicked each item and color to be included to ensure an individual could paint just like he does on television. This Master Paint Set is a staple item in the Bob Ross line of products, and the minute you open the box, you can pick up and paint your very own landscape (just need the addition of a canvas and thinner). The paints included in the set are the most often used in Bob’s techniques, and can conveniently be mixed together to make almost all the colors in the Bob Ross line. The Albrecht Dürer artists’ watercolor pencil has been prized for many years by creative minds all over the world for its exceptional properties. The Albrecht Dürer Magnus has a 5.3 mm lead and a very soft and vibrant color laydown. It is ideal for large-scale drawing and covering large areas quickly. The voluminous pencil shape is gentle on the wrist. Even after long periods of use, the Albrecht Dürer Magnus enables fatigue-free painting and drawing. All 24 colors available have a maximum lightfastness rating and are fully water soluble. HomeHobby Watercolor Studio Kits are All-In-One kits for Sketch, Watercolor and Acrylic Art. Learn to draw and paint from international award winning artists. Our All-in-One kits each focus on projects in designated skill ranges from beginner to expert. Find all the supplies needed, along with step guides in each box. Our paints, brushes, paper, pens, and canvas are carefully selected to ensure the right assortment and quality, in an affordable package. All-in-One Kits from HomeHobby® - coming soon from 3L Corporation. Fast 10 to 15 minute set time! 1-to-1 ratio. Cast pieces can be drilled, sanded, carved, machined and painted. Ideal for fast prototyping or duplication of original. Hard, durable, fine detail castings. Can be colored with Castin'Craft Pigments as well as powdered pigments. Silicone Mold Making Rubber for Non-Sag, Fast Curing Applications. Has 15 to 25 minutes working time, fast 3-hour cure. Ideal for both vertical and horizontal applications. Will not drip, run or sag. Produces excellent detail from original. Self-releasing, no mold release required. No shrinkage. Newell’s new Adult Coloring Kits are now available! Perfect for the holiday gifting season, new Prismacolor, Sharpie, and Flair kits are now available at various retailers. Each kit features a custom mix of product as well as a coloring book. The Sharpie Aquatic Adult Coloring Kit includes 10 Sharpie Fine and 10 Ultra Fine markers in a unique color mix, selected to pair perfectly with a custom coloring book with a bold aquatic theme. The Paper Mate Flair Glam Closet Kit features a custom selection of Flair porous pens with exciting colors perfect for coloring in the ideal closet. The Prismacolor Kit is a complete collection of all of the tools needed to experience the Premier product line; the kit includes 24 pencils, a black fine line marker, a blender, an eraser, a sharpener, and a book of Penguin Random House illustrations from popular Adult Coloring books. There are displays in the standard display catalog available to support these kits. Standard displays include trays for each individual kit, a floor stand featuring all three kits, and a large tray featuring all three kits. There is also a standard Prismacolor core 24ct Premier Tin side wing featured in the standard catalog. These are all available immediately but may be subject to various lead times. Newell is supporting the new Adult Coloring Kits with the biggest media investment in Prismacolor brand history. The Prismacolor television commercial will air on various networks including TLC, E!, HGTV, Nickelodeon, MTV, VH1, Animal Planet, WE, OWN, Oxygen, and more. There is also a new campaign visual that can be leveraged for catalog advertising and the aesthetic of which will be leveraged for the standard displays. Available at the following Fine Art Wholesalers: Alvin, C2F, MacPherson’s and SLS. The Gelli Arts® Mini Printing Kit is a compact kit full of hours of creative fun! Each kit includes a durable, reusable mini plate that can be used to print or stamp, a plastic container to be used for storage and as a stamping block, a 3 sided comb for mark making and a durable punchinella stencil. 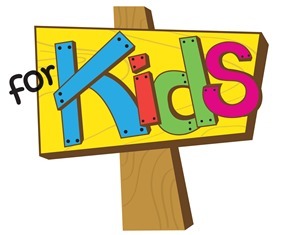 Our package showcases several printing projects and directs purchasers to a webpage with additional projects - www.gelliarts.com/pages/momsandkids. MSRP $17.99. Printing plates are non-toxic, odor free and made in the USA. Two kits are available - one with a round shaped printing plate and one with a hexagon shaped mini plate.